The Food and Agriculture Organization (FAO) Assistant Director-General and Regional Representative for Africa, Abebe Haile-Gabriel, has called for intensified partnerships among key stakeholders in a bid to address the food, security and nutrition as well as extreme climate variability challenges facing the African continent. “Climate variability and extremes are key drivers behind the recent rise in global hunger and one of the leading causes of severe food crises”, Haile-Gabriel stated. Speaking at his maiden interaction with the media since he assumed the new role as head of the FAO regional office for Africa, the Assistant Director-General and Regional Representative for Africa advocated increased partnerships, large-scale funding of integrated disaster risk reduction and management, as well as short, medium and long-term climate change adaptation strategies to tackle the problem. “Climate smart agriculture such as the production of crop varieties that are resilient, and early maturing varieties would also be of help in these circumstances”, he added. Available data has it that the number of people suffering from hunger has been on the increase over the past three years, with the situation worsening in South America and most regions of Africa. The risk of food insecurity and malnutrition is greater in recent times because livelihoods and livelihood assets are more exposed and more vulnerable to changing climate variability and extremes. Worldwide, the number of people affected by undernourishment or chronic food deprivation is estimated to have increased from 804 million in 2016, to 821 million in 2017. “Poor access to food, particularly healthy food, contributes to undernutrition as well as overweight and obesity. The high cost of nutritious foods, the stress of living with food insecurity and physiological adaptations to food restriction, help explain why food insecure families have a higher risk of overweight and obesity”, the ADG emphasized. Haile-Gabriel observed that a vast majority of young people still viewed agricultural activity from a narrow perspective, limiting it only to land preparation, planting and weeding. He called on Africa’s youth to broaden their perception of agriculture by taking a holistic view of all the processes it entails. “Even though in modern times those activities are mechanized, such old misconceptions have contributed to making agriculture look unattractive to most young persons”. The ADG stressed that numerous business opportunities abound in the post-harvest stages of agricultural production, citing the storage, processing and value addition aspects of it. “It is estimated that by 2030, the agri-business sector in Africa would mobilise several trillions of dollars”, he said, and urged the youth therefore to position themselves strategically so they could take advantage of those opportunities to improve their lives. The issue of young persons in Africa getting onboard the agricultural bandwagon has become even more crucial considering the fact that a significant percentage of the present crop of farmers on the continent are becoming over-aged and would soon be rendered redundant. On the role of the FAO in the wake of last year’s Fall Armyworm invasion in Ghana, Haile-Gabriel indicated that the FAO had undertaken series of actions through Technical Co-operation projects and other funding mechanisms not only in Ghana but also in other affected African countries to help strengthen their capacities to deal with menace. “So far, as of November 2018, there is an active Technical Co-operation Programme for the regional level in Africa, in addition to a total of 16 Fall Armyworm projects currently operational in 16 African countries. Furthermore, FAO’s IT Solutions has developed a mobile phone app to be used by farmers, community focal persons and extension agents to collect data when scouting fields and checking pheromone traps. FAO has also facilitated the establishment of Farmers Field Schools (FFS) and the preparation of FFS field guide on Integrated Pest Management for FAW which was launched on February 16, 2018. The ADG reiterated FAO’s continued commitment to mobilise partnerships towards the attainment of the objective of ending hunger and malnutrition in Africa by 2025, and worldwide by 2030, as well as the successful implementation of the Sustainable Development Goals. 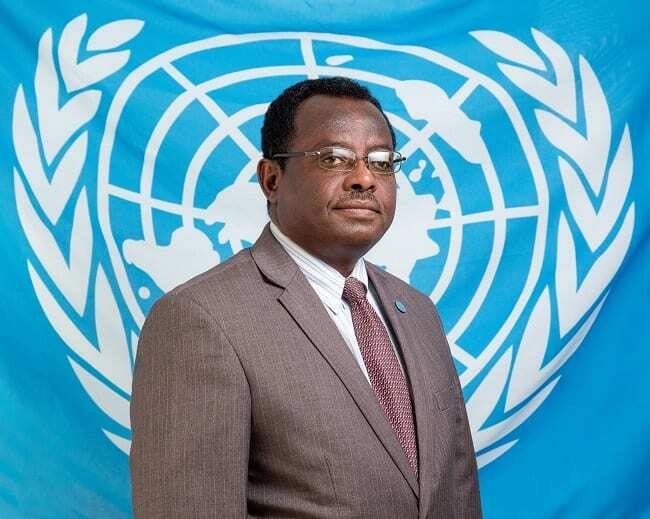 FAO is prepared to put its expertise and technical assistance at the disposal of its partners for the realization of shared goals, but in any given situation national leadership remains an important factor, Haile-Gabriel emphasized.